MVCTC Superintendent, Nick Weldy and Beth Price from Miami Industrial Trucks, accepting the 2017 Friend of MVCTC Award for Mr. Mark Jones. Englewood, Ohio – The Miami Valley Career Technology Center (MVCTC) named Mark Jones of Miami Industrial Trucks (MIT) as the recipient of the 2017 Friend of MVCTC Award. The Friend of MVCTC was awarded at the 27th annual All Advisory Dinner held on Thursday, October 5, in the MVCTC Student Activity Center. 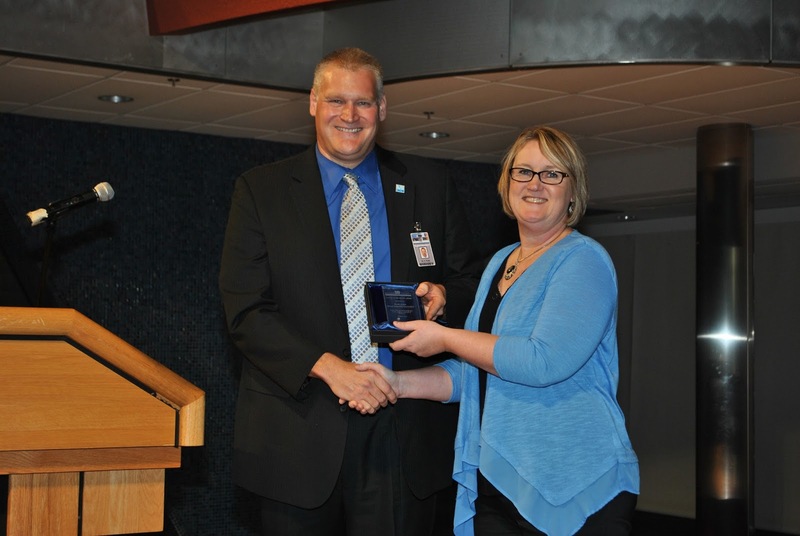 MVCTC Superintendent, Dr. Nick Weldy, says, “This award is given each year to someone who is always supportive of our mission, our programs, and our students. Those nominated are the professionals who willingly give a tremendous amount of time and talent to ensure MVCTC has continued success”. Mark Jones and the staff at Miami Industrial Trucks have been instrumental in arranging for the MVCTC Diesel Power Technology program to be on their national on-line CAT training program. The Diesel Power Technology program was one of, if not the first high school to receive this training. MIT has also provided a lift truck each year for use and instruction in the Diesel Power Technology lab. Unfortunately, Mr. Jones was unable to attend the Advisory Dinner, Beth Price from Miami Industrial Trucks was able to accept the award in his place. The evening also included a district update by Dr. Weldy, and the opportunity for the 250 plus business partners to meet with MVCTC staff. During the program advisory committee meetings, business partners, employers, alumni, students and parents worked with the career technical instructors to guarantee what is being taught at MVCTC is what students will need to know to be successful in their chosen careers. On November 7th, voters will see a 1.43 mils bond/levy on the ballot to modernize the facilities and equipment at MVCTC. The request is equal to $4.17/month for the owner of a $100,000 house. After 10 years this amount drops to 1.09 mils or $3.18/month. MVCTC qualified for the state to pay 47% of the co-fundable portion of this project. The MVCTC has not requested any separate facility money since the district was built in 1968-1970.